You can download Underground via Nintendo’s eShop. 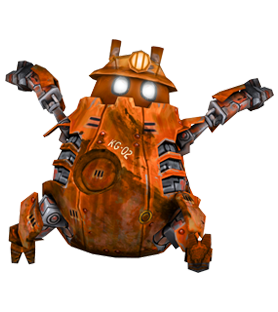 Underground is a challenging and seriously fun puzzle game by Grendel Games, created especially for the Nintendo Wii U. At the same time, it’s a validated training tool for laparoscopic motor skills. This award winning game features a heartwarming storyline about a little girl named Sari and Sw4nk, her butler robot friend. When Sw4nk does an unsatisfying job, Sari’s father sends him away to work in the mines. Sari goes against her father’s will and tries to break him out. While traveling through the underground caverns, Sari and the robots get themselves into a world of trouble and its up to you to help them out of their predicament. During their quest for safety you will be presented with challenging situations in four unique worlds; each with their own threats and opportunities. Discover all the different building blocks and build your way up to the surface in this charming game about friendship, robots and a little girl who loves to dance. Practice makes perfect. Surgical doctors-in-training residents all around the world have access to various box trainers and virtual reality simulators to train and maintain their laparoscopic skill set. However, due to a high workload, at the end of the day not everyone has time and energy to practice on these repetitive machines. By turning these drills into a fun and engaging video game, experienced doctors and doctors-in-training can practice them at home, and, more importantly, have fun while doing so. The Underground hardware has been scientiﬁcally validated through its stages of development. Not only does it possess solid face validity, but it also posesses a very strong construct and concurrent validity. A basic level of the game was able to distinguish various levels of laparoscopic expertise and showed a high and signiﬁcant correlation (r = 0.812, P < 0.001) to the FLS Peg Transfer task, a gold standard for measuring a wide array of laparoscopic skills. coordination, inverse movements and bi-manual dexterity. Although you can play Underground using the Wii U GamePad, actual motor skill training only takes place when using the custom made laparoscopic controller. The laparoscopic controller’s two handsets each house a Wii Remote and a Wii Nunchuk. Each handset has a lance that is anchored to the playing field through a hinge joint. The playing field registers motion and rotation from each of the handsets using infrared light. This enables the player to control the game using motions identical to those performed during laparoscopic surgery. The laparoscopic controller including the playing field and two handsets, with a manual. Batteries for the playing field are included. What will you need in addition? A Nintendo Wii U game console. Any of the available consumer models will suffice. Two Wii Remote controllers and two Wii Nunchuk controllers. These do not come with Nintendo’s Wii U system by default. Sold separately at any toy store or ordered online (at for instance Amazon.com.) Wii Remote and Wii Nunchuk controllers sold with the original Nintendo Wii game console are also compatible. The game. The game can be ordered from Nintendo’s online eShop from within the Wii U game console. Any television screen or monitor that has an HDMI connection. Note for US customers: As of the beginning of 2019, Nintendo, the distributor of the game, has removed Underground from the US electronic Wii U store, as a preparation for discontinuing their Wii U platform. Nintendo will not allow Underground back onto their store. We have disabled the option to purchase the controller in this region. If you would like to buy online using credit card or PayPal, order from our webshop here. If you would like to submit a purchase order for our laparoscopic controllers, please contact sales@undergroundthegame.com for a quote. While playing this spectacular puzzle- action game, players subconsciously train their basic laparoscopic skills, such as depth perception, eye-hand coordination, inverse movements and bi-manual dexterity. By packaging serious matter, such as laparoscopic skills training, in a fun and easily accessible package, surgeons and residents can practice their operating skills while playing a video game. It’s a win-win situation! A validation study has been conducted around the idea, validity and effect of the game. You can also download a digital version of the thesis. Surgical doctors-in-training residents all around the world can play Underground from any location, even their homes. Making this an easily accessible training tool. Underground is also a validated training tool. Its hardware has been scientiﬁcally validated through its stages of development. Not only does it possess solid face validity, but it also possesses a very strong construct and concurrent validity. All in all making this an effective training. At Cutting Edge, we believe that training solutions should be reliable and affordable. That is why we chose to develop our game on a commercially available, consumer- grade video game console. The game can be played using the Wii U GamePad (non medical) and with the specially developed (separately sold) laparoscopic controller for medical purposes. Off course actual training only takes place when using the laparoscopic controller. Does this game really train laparoscopic motor skills? Yes, it does. A validation study has been conducted around the idea, validity and effect of the game. You can also download a digital version of the thesis. Underground is available exclusively on the Nintendo Wii U eShop only in the Europe region. In order to purchase the game, you will need to acces the Nintendo Wii U eShop through your Nintendo Wii U. Where can I buy the laparoscopic controller? If you are a consumer and you would like to buy online using credit card or PayPal, order from our webshop here. If you are a business and would like to submit a purchase order for our laparoscopic controllers, please contact sales@undergroundthegame.com for a quote. Will you supply the Wii Remote and Wii Nunchuk controllers? No. The Wii Remote and Wii Nunchuk controllers need to be purchased separately, unless you order a complete pre-installed set from us. See the Controller page for more information. Do I need the laparoscopic controller to play the game? The laparoscopic controller is not required in order to play the game, but you will not be able to train your laparoscopic motor skills without it. The game software is €19,95, and the laparoscopic controller costs €249,- (Includes VAT). Can I use my Wii to play this game? Unfortunately, no. Underground only runs on Wii U. There are no current plans to support any other systems. Do I need a separate television screen? You will need a Wii U game console to play Underground. The Wii U game console connects to any television or monitor that has an HDMI connection. At Cutting Edge, we believe that training solutions should be reliable and affordable. That is why we chose to develop our game on a commercially available, consumer grade video game console. 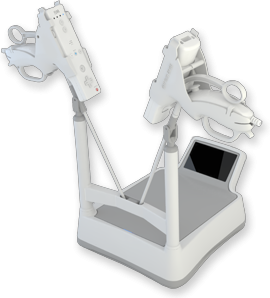 The Underground laparoscopic controller, which requires two standard Wii™ Remote and Nunchuk™ controllers, is sold separately for a price that is comparable to existing game hardware. Underground can also be played by the non-medical consumer without the laparoscopic controller using the Wii U™ GamePad.